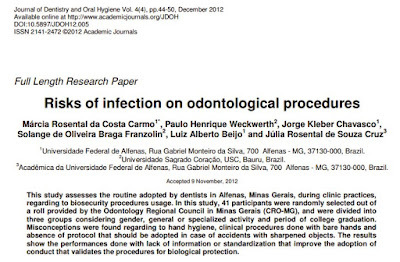 This study assesses the routine adopted by dentists in Alfenas, Minas Gerais, during clinic practices, regarding to biosecurity procedures usage. 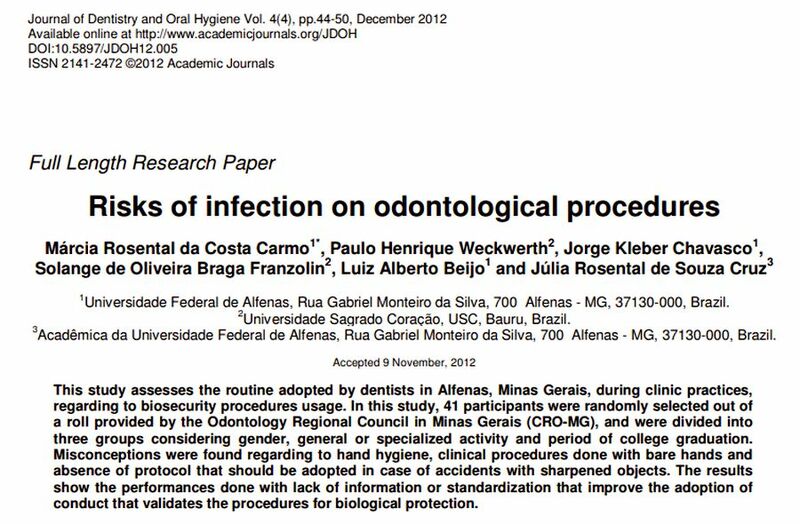 In this study, 41 participants were randomly selected out of a roll provided by the Odontology Regional Council in Minas Gerais (CRO-MG), and were divided into three groups considering gender, general or specialized activity and period of college graduation. Misconceptions were found regarding to hand hygiene, clinical procedures done with bare hands and absence of protocol that should be adopted in case of accidents with sharpened objects. The results show the performances done with lack of information or standardization that improve the adoption of conduct that validates the procedures for biological protection. 1 Universidade Federal de Alfenas, Rua Gabriel Monteiro da Silva, 700 Alfenas - MG, 37130-000, Brazil. 2 Universidade Sagrado Coração, USC, Bauru, Brazil. 3 Acadêmica da Universidade Federal de Alfenas, Rua Gabriel Monteiro da Silva, 700 Alfenas - MG, 37130-000, Brazil.